Abney Park Cemetery has a grave decorated with an eye-catching bicycle. 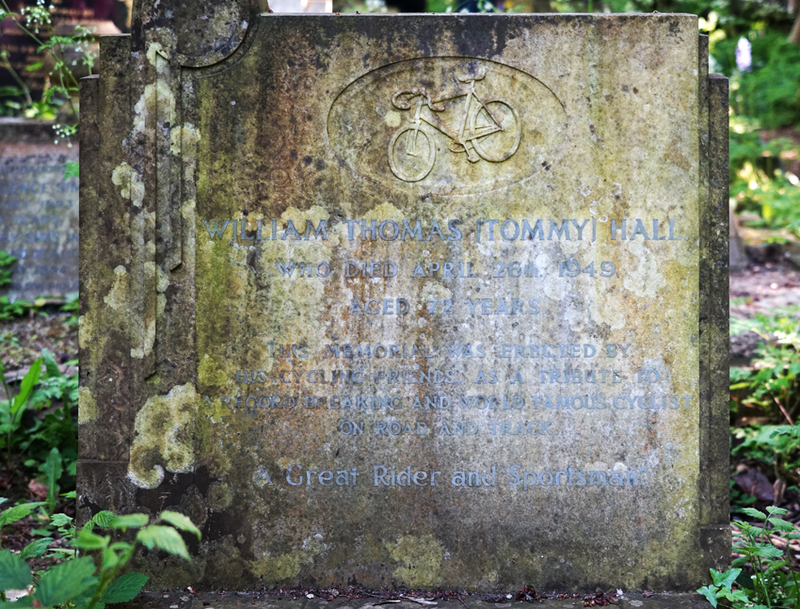 The text is less striking against its now-discoloured background, but does include the vital details: this is the headstone of Tommy Hall, 'great rider and sportsman' who was 'a record breaking and world famous cyclist on road and track'. Born in Croydon, he lived in London throughout his life. Hall's greatest achievements were in motor-paced events. In 1903, he broke the hour record by cycling over 54 miles; the following year, he came third in the European stayer championship. 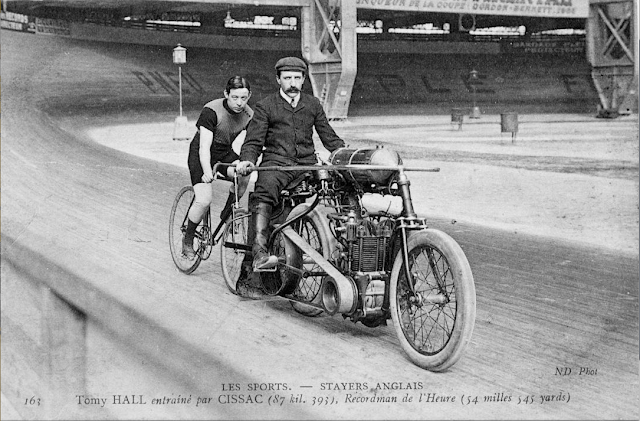 Motor-paced races were held in velodromes and involved the cyclist following a powerful motorbike as closely as possible to take advantage of their slipstream. In often crowded events, he would be dependent upon the motorcyclist's skill in keeping clear of opponents as well as reliant upon their setting an appropriate pace - fast enough to allow him to win, not so fast that he couldn't keep up. 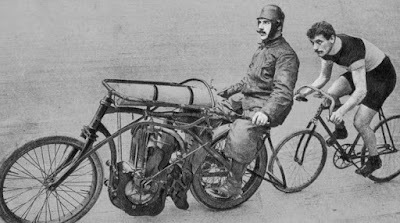 The motorbikes were specially adapted, not only for speed but also to sit the rider as far back and upright as possible to maximise their effectiveness as a windbreak. Bicycles were specially adapted, too. The front wheel was smaller than the back to allow the rider to get closer to the motorbike in front. High handlebars helped breathing. Support struts ensured the saddle and handlebar stem stayed rigid. The races were dangerous: motorbikes and bicycles were not always successful at keeping clear of each other. There were few rules, protective clothing and helmets were not worn by the cyclists, and tyres were prone to bursting at speed. The main concession to safety was a roller bar at the back of each motorbike to prevent the cyclist touching its rear wheel. Injuries were a common occurence, and deaths not unknown. The worst accident occurred in 1909, when a motorbike went into the stands, killing nine people. The sport would become more closely regulated, and remained popular for much of the twentieth century. The world championships continued until 1994 and there are still European championships. Hall's career lasted until 1914. He later trained other cyclists, sometimes himself riding a motorbike as pacer. As his gravestone tells us, he lived until the age of 72, dying in 1949. Motor-paced cycling reached its extreme in 1995 when Fred Rompelberg reached 167 mph riding behind a dragster on Utah's salt flats! A large Wiltshire village, Market Lavington's points of interest include the church, wonderful Village Museum full of local history ... and this ghost sign. 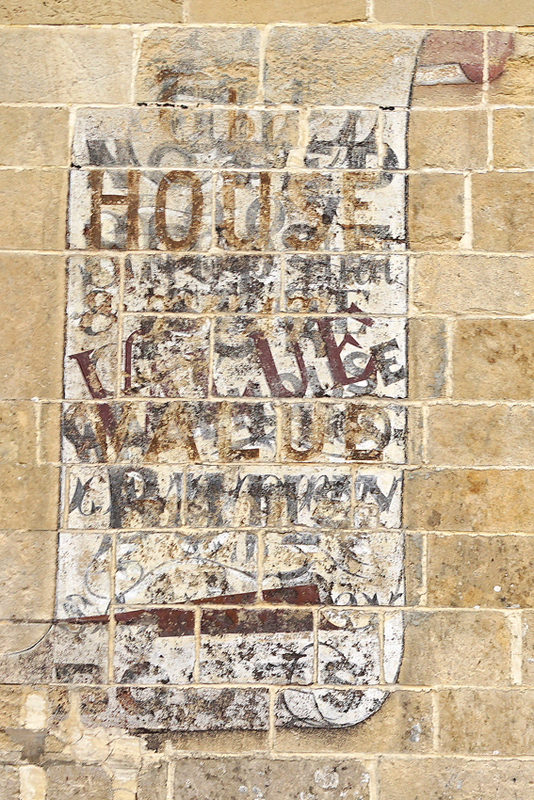 A rather nice scroll remains clear, but the lettering is more tricky, not least because this is a palimpsest of, I think, four advertisements. 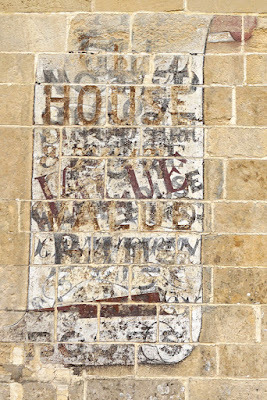 Words I've been able to decipher included NOTED, HOUSE, BOOT & SHOE, WAREHOUSE, VALUE, and BOOTS. Even the scroll has been extended at the bottom. Happily, the museum's blog has some of the answer. 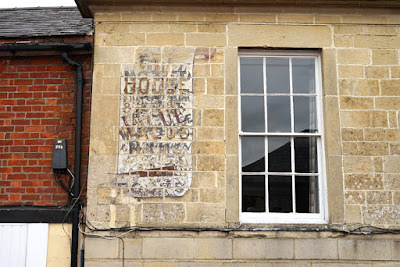 In 1993, the parapet collapsed - and a photo of the damage shows that only the uppermost sign was then visible, reading 'The house that value built'. Another photo shows the wording in 1913: 'The noted boot & shoe warehouse - Lavington and Salisbury' (also visible in another post). The building was then Walton's department store. Two mysteries solved! However, at least two signs remain to be deciphered - one which has 'VALUE' in block letters straight across, and another which has the curls and flourishes just visible today and which was probably the oldest. So, not a complete solution - but as consolation, there are more (and more legible) old signs to be seen in the Village Museum. 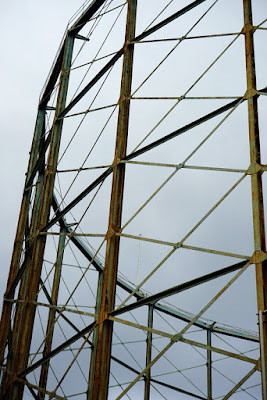 Once, they were important amenities; now, gasholders have largely lost their function, but remain familiar landmarks. 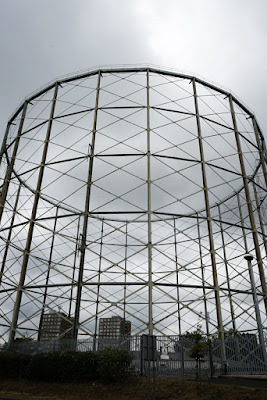 Gasholder No. 13 at Old Kent Road is also recognised as an important piece of industrial history, and is Grade-II listed. The gasholder (or gasometer) stored gas. As the tank (lift) filled with gas, it would rise up within its metal frame, with water at the base providing a tight seal. When demand exceeded supply, gas would be taken from the holder, which would descend again as it emptied. However, as town gas is no longer manufactured in local gasworks, and supplies of natural gas depend upon new pipeline technology, these huge storage tanks are no longer required. Why is Old Kent Road's so significant? The listing text explains that it was the largest gasholder in the world when engineer George Livesey built it in 1879-1881. It was also an important engineering innovation, using the latest techniques to create something entirely new which served as a model for future constructions. 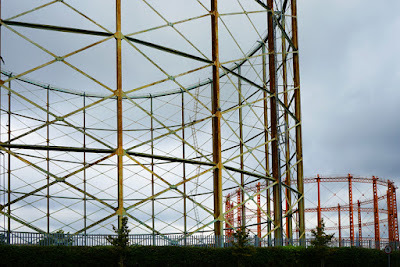 Its unusually thin wrought iron and pioneering use of mild steel were used in a structure which 'treated the guide-frame as a cylindrical lattice shell for the first time, the gasholder had to be built up tier-by-tier since it relied on the complete circle for integrity'. This would be a source of inspiration for helical structures by future engineers. Inside this frame, the tank was the deepest constructed at the time. It would remain one of the deepest ever built. 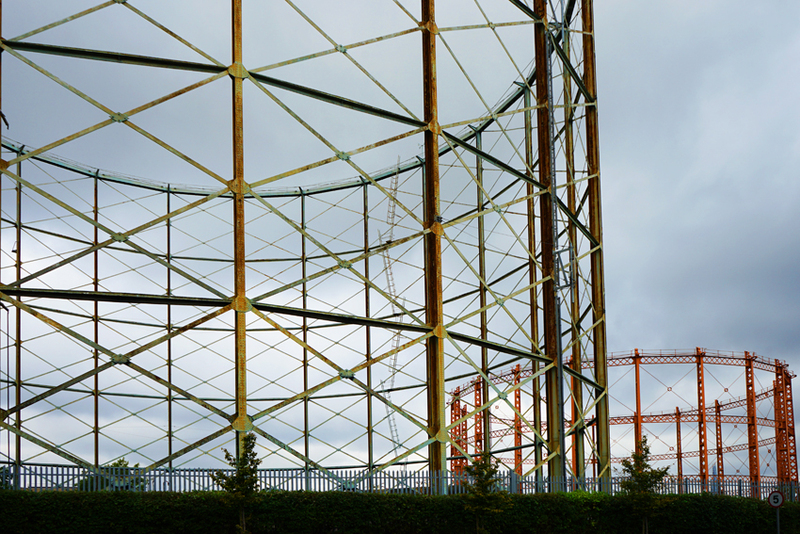 Even the appearance of the gasholder was radical. No decoration was applied, a departure from earlier gasholder designs (and indeed Victorian industrial architecture generally). The new design was drastically cheaper than earlier constructions - and no doubt its lack of ornament helped cut costs further! Livesey was the obvious choice to build the gasholder, and not only because of his engineering talent. It was part of the South Metropolitan Gas Company's gasworks; the company chairman was his father Thomas. 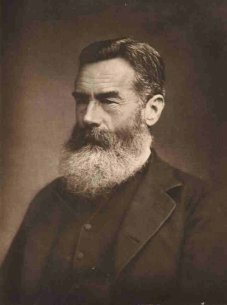 Livesey was Company Secretary and would himself become chairman in 1885. Among his acts of philanthropy was founding Camberwell Public Library No. 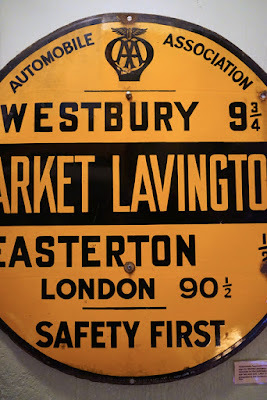 1 (later the Livesey Children's Museum and now closed), just across the road from the gasworks. He would also develop a scheme which allowed a gas meter, lighting and cooker to be installed in a customer's home without payment. The cost of the installation would be recovered through subsequent payments. This made gas lighting and cooking accessible to working class families. Gasholders are now an increasingly threatened part of our industrial heritage. Obsolete, they pose challenges for reuse: the ground on which they stand is often heavily polluted. However, they are also valued as historically significant local landmarks. 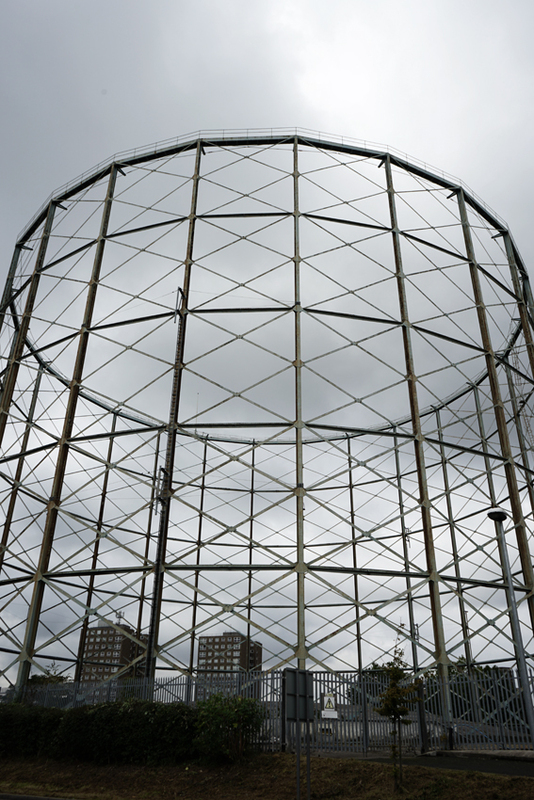 There was outcry when demolition of Gasholder No. 1, familiar backdrop to the Oval cricket ground, was to be demolished; it was saved by listing. While these listed examples are secure, however, gasholders in general are disappearing from the landscape.